An image of the 217 kilometer long asteroid Kleopatra, discovered in 1880, taken by the Keck II telescope with adaptive optics, before (left) and after processing. 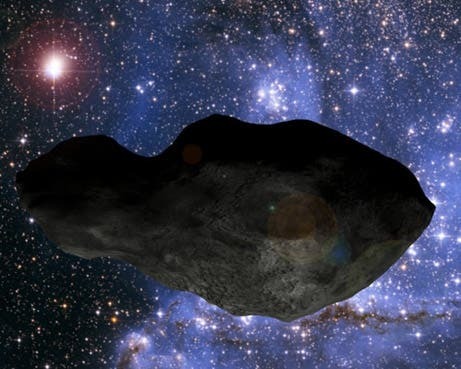 The asteroid, shaped like a dog bone, has two moons, the outer Alexhelios and the inner Cleoselene.The asteroid Kleopatra, like its namesake, the last pharaoh and queen of Egypt, gave birth to twins – two moons probably spawned by the asteroid sometime in the past 100 million years. In the February issue of the journal Icarus, a team of French and American astronomers, including Franck Marchis, a research astronomer at the University of California, Berkeley, and Pascal Descamps, an astronomer at the Institut de Mécanique Céleste et de Calculs des Éphémérides (IMCCE) of the Observatoire de Paris, report the discovery and also confirm earlier reports that the asteroid is shaped like a dog bone. The team’s detailed study of the asteroid using the large Keck II telescope is Hawaii allowed it to determine the precise orbits of the twin moons and calculate the density of Kleopatra, showing that the asteroid is probably a big pile of rock and metal rubble. “Our observations of the orbits of the two satellites of 216 Kleopatra imply that this large metallic asteroid is a rubble pile, which is a surprise,” said Marchis, who is also a planetary scientist at the SETI Institute in Mountain View, Calif.
“Asteroids this big are supposed to be solid, not rubble piles.” The Committee on Small Body Nomenclature of the International Astronomical Union accepted the proposal of Marchis and his collaborators to name the moons after Cleopatra’s twins by Mark Antony: Cleopatra Selene II and Alexander Helios. The outermost moon is named Alexhelios and the innermost moon is Cleoselene. In Greek mythology, Helios and Selene represented the sun and moon, respectively. The moons Alexhelios and Cleoselene orbit their parent asteroid, Kleopatra, over a period of three days in January 2008. The team continues to observe large asteroids in search of ones with moons, which allows them to calculate the density and determine the prevalence of porous, rubble pile asteroids.